This phenomenal rate of melting has seen global sea levels rise by more than half an inch - and experts predict it will get worse. Scientists have predicted a 'multi-meter sea level rise from Antarctica in the coming centuries' as a result of the vast loss of ice. 'That's just the tip of the iceberg, so to speak,' said lead author Eric Rignot, Donald Bren Professor and chair of Earth system science at University of California, Irvine. The forty-year long research looked at 18 regions on the frozen continent including 176 basins and a variety of islands. Academics worked alongside NASA's Jet Propulsion Laboratory (JPL) on the project and compared snowfall accumulation in interior basins with ice discharge by glaciers at their grounding lines, where ice begins to float in the ocean and detach from the bed. Data from aerial images taken by NASA's Operation IceBridge at a height of 1,150 feet (350 metres) allowed researchers to access satellite data from multiple space agencies. In the paper, published in the journal Proceedings of the National Academy of Sciences, glaciologists found East Antarctica plays a pivotal role in total ice mass loss. 'The Wilkes Land sector of East Antarctica has, overall, always been an important participant in the mass loss, even as far back as the 1980s, as our research has shown,' Dr Rignot said. 'As climate warming and ozone depletion send more ocean heat toward those sectors, they will continue to contribute to sea level rise from Antarctica in decades to come,' concluded Dr Rigno. WHAT DO RECENT STUDIES REVEAL ABOUT ANTARCTICA? The Antarctic Ice Sheet lost around three trillion tonnes of ice between 1992 and 2017, according to research led by Leeds University. This figure corresponds to a mean sea-level rise of about eight millimetres (1/3 inch), with two-fifths of this rise coming in the last five years alone. The finds mean people in coastal communities are at greater risk of losing their homes and becoming so-called climate refugees than previously feared. In one of the most complete pictures of Antarctic ice sheet change to date, an international team of 84 experts combined 24 satellite surveys to yield the results. It found that until 2012 Antarctica lost ice at a steady rate of 76 billion tonnes per year - a 0.2mm (0.008 inches) per year contribution to sea level rise. However, since then there has been a sharp, threefold increase. However, new research published by Northern Illinois University shows that between roughly 14,500 and 9,000 years ago, the ice sheet below sea level was even smaller than today. Over the following millennia, the loss of the massive amount of ice that was previously weighing down the seabed spurred an uplift in the sea floor. Then the ice sheet began to regrow toward today's configuration. 'The WAIS today is again retreating, but there was a time since the last Ice Age when the ice sheet was even smaller than it is now, yet it didn't collapse,' said Northern Illinois University geology professor Reed Scherer, a lead author on the study. 'That's important information to have as we try to figure out how the ice sheet will behave in the future', he said. The stability of the largest ice sheet on Earth is an indication to scientists that it could hold up as temperatures continue to rise. If all the East Antarctic Ice Sheet melted, the sea level would rise by 175 feet (53 metres). However, unlike the Greenland and West Antarctic ice sheets it seems it would be resistant to melting as conditions warm, according to research from Purdue University and Boston College. Their research showed that land-based sectors of the East Antarctic Ice Sheet were mostly stable throughout the Pliocene (5.3 to 2.6 million years ago). This is when carbon dioxide concentrations in the atmosphere were close to what they are today - around 400 parts per million. 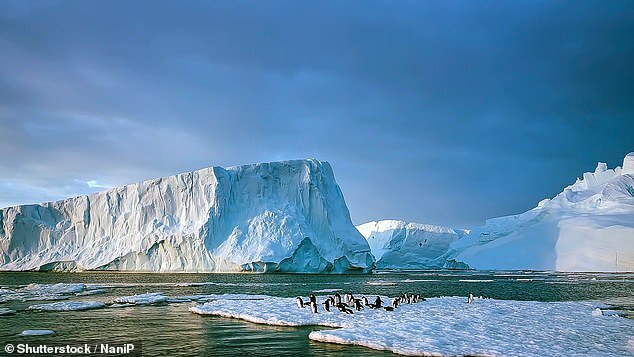 'Based on this evidence from the Pliocene, today's current carbon dioxide levels are not enough to destabilise the land-based ice on the Antarctic continent,' said Jeremy Shakun, lead author of the paper and assistant professor of earth and environmental science at Boston College. 'This does not mean that at current atmospheric carbon dioxide levels, Antarctica won't contribute to sea level rise. 'Marine-based ice very well could and in fact is already starting to contribute, and that alone holds an estimated 20 meters of sea level rise,' he said. One of the largest uncertainties in future sea-level rise predictions is how the Antarctic ice sheet reacts to human-induced global warming. Scientists say that time is running out to save this unique ecosystem and if the right decisions are not made in the next ten years there will be no turning back. Researchers from Imperial College London assessed the state of Antarctica in 2070 under two scenarios which represent the opposite extremes of action and inaction on greenhouse gas emissions. This results in Antarctica's ice shelves remaining intact, slowing loss of ice from the ice sheet and reducing the threat of sea level rise. The retreat of the West Antarctic ice masses after the last Ice Age was reversed surprisingly about 10,000 years ago, scientists found. In fact it was the shrinking itself that stopped the shrinking: relieved from the weight of the ice, the Earth crust lifted and triggered the re-advance of the ice sheet. According to research from the Potsdam Institute for Climate Impact Research (PIK) this mechanism is much too slow to prevent dangerous sea-level rise caused by West Antarctica's ice-loss in the present and near future. Only rapid greenhouse-gas emission reductions can, researchers found. 'The warming after the last Ice Age made the ice masses of West Antarctica dwindle,' said Torsten Albrecht from the Potsdam Institute for Climate Impact Research. Researchers found that warm ocean water flowing in channels beneath Antarctic ice shelves is thinning the ice from below so much that the ice in the channels is cracking. Surface meltwater can then flow into these fractures, further destabilising the ice shelf and increasing the chances that substantial pieces will break away. The researchers, led by the University of Texas at Austin, documented this mechanism in a major ice break up, or calving, event in 2016 at Antarctica's Nansen Ice Shelf. 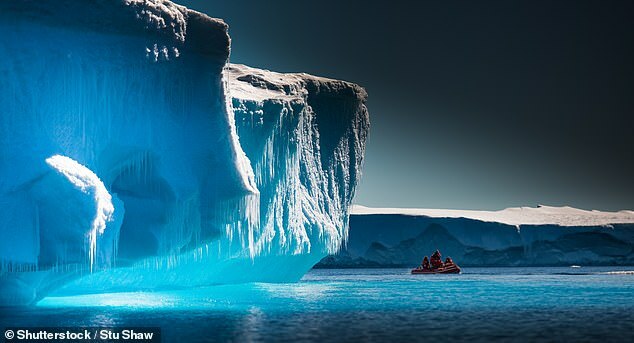 The findings are concerning because ice shelves, which are floating extensions of continental glaciers, slow down the flow of ice into the ocean and help control the rate of sea level rise, according to the study. 'We are learning that ice shelves are more vulnerable to rising ocean and air temperatures than we thought,' said Professor Christine Dow, lead author of the study. 'There are dual processes going on here. One that is destabilising from below, and another from above. 'This information could have an impact on our projected timelines for ice shelf collapse and resulting sea level rise due to climate change', he said.